Want some killer tips to help you scale and score more new deals? Check out how one digital agency owner jumped from landing an $18K project to a $500K project by having the right framework in place. And by learning the systems you, too, can attract ideal clients who can pay what you’re really worth. It just takes the right mindset and a solid growth strategy. It’s all about doing more with less, hiring smart, knowing what to say ‘no’ to and attracting the right clients. Getting clients to pay what you’re worth. 3 ways to make your agency more marketable. How to grab those first clients. Today, I talked with Dean LaGrange founder of LaGrange Digital the Facebook ad agency he grew from the ground up. 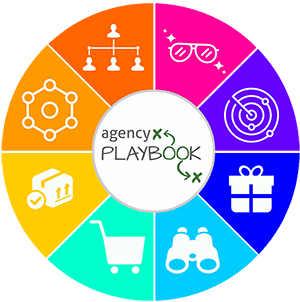 Dean bought the Agency Playbook and he’s been absolutely killing it with his agency. Dean actually applied the strategies in the Agency Playbook and shared this story with me about going from an $18k project to a $500k project. I knew I had to get him on the podcast to share this same story with my listeners so you know what’s working. Something you’re not good at. Something you don’t like doing. Something that’s taking up too much of your time. To figure out what that something is, you need to do a self-audit. Really look at yourself as an agency owner and figure out what you’re good at and what you need a little help with. Then, hire the person that’s going to give you that help. It could be sales, another marketer, someone who’s good with finances, or anyone else. I’m not going to lie — there’s a plug here — but NO, I did not put Dean up to it 🙂 He says he knew he had good processes in place, but also was self-aware enough to know what he doesn’t know. The agency was “making it” but he realized what was missing what a mentor or adviser with the experience and knowledge to do what he was trying to do. That’s when Dean decided to invest in my Agency Playbook so he could learn how to find clients, what to charge, how to position the agency, and most importantly how to determine the value of the agency’s services. After going through the Playbook, Dean took a proposal that he was going to charge at $18,000 and increased it to $500,000 because he better understood his agency’s value. And, BOOM! And folks, that was within 3 days of purchasing the Agency Playbook. The real lesson was that Dean learned clients are willing to pay a premium when you can demonstrate the value of your services. He just didn’t know exactly how to connect the dots for them – until now. New agencies are prone to the infamous client drought. You don’t have the testimonials or street cred to back yourself up yet. So, how do you make your agency appealing to new prospects? Niche. I’ve said it a million times, and yet there’s still resistance. Finding a niche is an easy way to separate yourself from the pack. Figure out what granular value you can offer to clients. Do you have experience in healthcare? Are you really good at AdWords? Find out what makes you unique — either a horizontal or a vertical — and use it as the pillar for agency growth. Have the right processes. You don’t need a portfolio to start attracting the right clients. But, you do need the right systems. Tell your potential clients what you do better than your competitors. And, give them the framework for how you can help them. Make sure you walk them through the plan of what you do and how you will get them their desired results. Work for free. If you’re hurting for clients, start offering your services for free. It can help you build up testimonials and case stories. Plus, it gives you some experience for the paid gigs. If you looked at that last section and thought “I get it, but where do I actually find clients?” I’ve got news for you. They’re everywhere! Dean walked around the business district of a neighboring town and asked business owners door-to-door if they needed help. I’ve heard for owners who have sent emails, talked to family friends, gone door-to-door, and even some that pick up the phone. 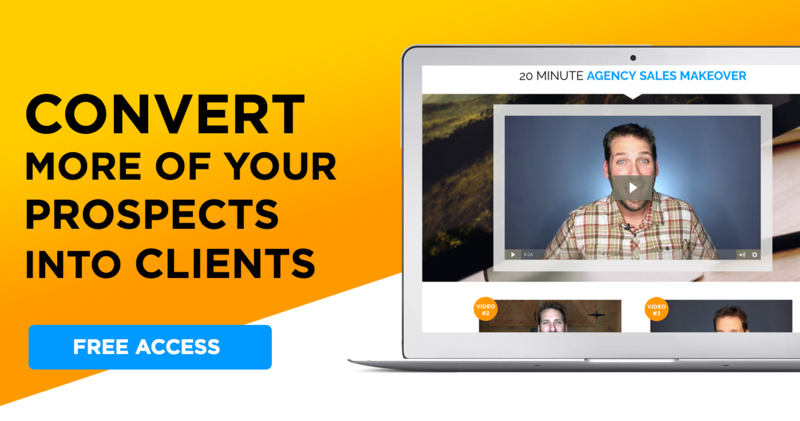 TIP –> When you’re looking for those first few clients, you need to do outbound. Inbound marketing will be your bread-and-butter once your agency is steady. But, outbound marketing can scale… fast! Even better, a advise a three-fold system of inbound, outbound, and strategic partnerships to make sure your pipeline stays constant.